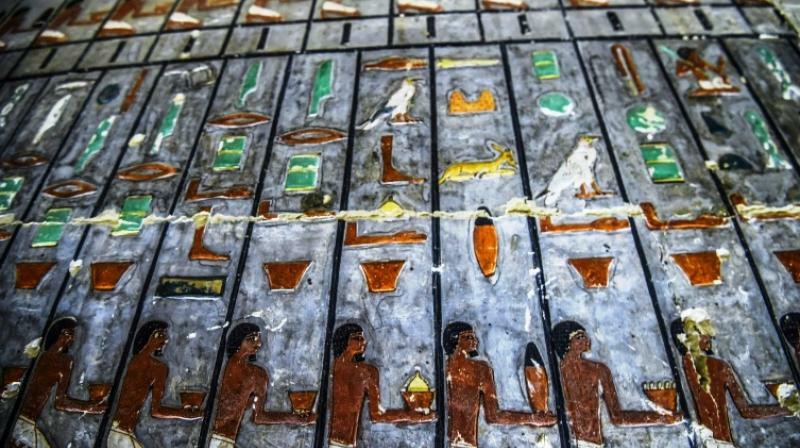 Egypt unveils colourful Fifth Dynasty tomb in a bid to revive tourism. Cairo: In a major archaeological discovery, Egypt on Saturday unveiled the tomb of a Fifth Dynasty official adorned with colourful reliefs and well preserved inscriptions. Flanked by dozens of ambassadors, Antiquities Minister Khaled al-Enani said the tomb was discovered last month. It is mostly made of white limestone bricks. Ornate paintings boast a special green resin throughout and oils used in the burial process, the ministry said. The tomb's north wall indicates that its design was inspired by the architectural blueprint of the dynasty's royal pyramids, the statement added. The excavation team has unearthed several tombs related to the Fifth Dynasty.